Cold Pressed Goji Berry and super fruit flapjack bar. Free From Gluten, Dairy, Wheat and Peanuts. Goji Berry Energy Bars – This is the first (and currently only) cold pressed flapjack to ever win 2 Gold Stars at The Great Taste Awards, which officially makes it the greatest tasting cold-pressed bar ever made! Judges at these prestigious awards described it as “an ideal snack on the go” with an “excellent combination of flavours”. 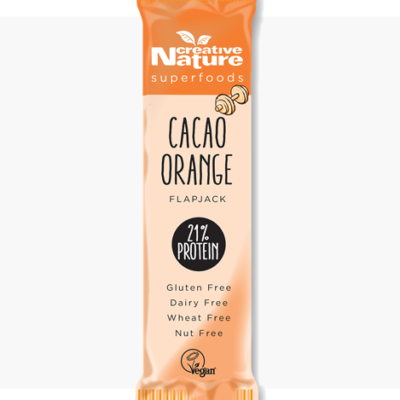 Creative Nature Goji Goodness Energy Flapjack Bar is the fruity bar that is packed full of various dried fruit, oats and our beautiful Goji Berries! It is a raw, vegan, dairy free, gluten free and nut free bar meaning it accommodates to pretty much all possible diets and allergies! 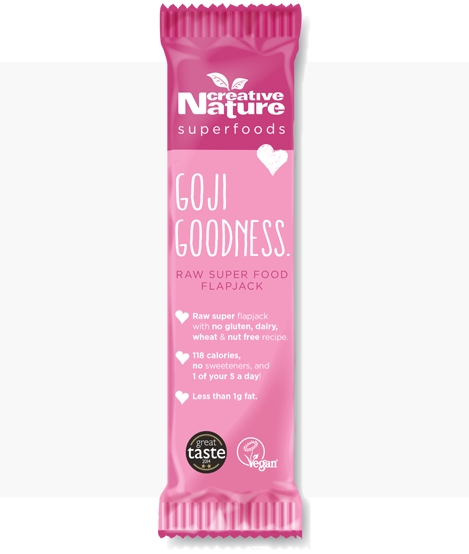 Whether you want to treat yourself to a mid-day pick me up or a delicious pre-workout snack, these Creative Nature Goji Goodness Energy Flapjack Bars have you covered. They are also a great topping for smoothie bowls if you are a fan of having some tasty and beautiful bowls in the morning! Not only do they taste incredible and provide you with a great bit of energy, but they have Vitamin C-rich ingredients to boost your antioxidant intake, contains 1 of your 5 a day and has no dates, syrups, agave, artificial sweeteners or sugar, making them healthier than most of the bars out on the market today! Ingredients: Dried fruit (apricots, cranberries, pineapple, Goji Berries (6%)), gluten free oats, sultanas, vegetable glycerine, natural strawberry flavouring. OMG how tasty are these bars!!! Being a gym goer 5 days a week i’m always looking for new products and something which will do the job when i’m in a hurry or something to fill the gap and keep me going. Great and love them, cant wait to try the other bars you offer. Very very tasty, highly recommend to anyone looking for the PERFECT BAR ! Really struggled to find a gluten free, nut free and generally ‘rubbish free’ bar that was tasty AND low in fat as I have gallbladder issues. Nuts are too fatty for me and other flapjacks are packed with processed oils and butters which don’t agree with me at all. Anything else just falls to bits and tastes bland. This bar, however, is perfection. Ticks all of the boxes for me – thank you! I picked one of these up in Sourced Market in Victoria thinking it was a good handbag size and would give me a little snack later in the day – it was SO delicious that I instantly looked online to see where I could buy more! Tastes naughty but its all healthy! Thank you Creative Nature Superoods!! Can’t wait to see what else you come up with. Just tried my first Creative Nature bar, the Goji Berry Energy Flapjack and it was so delicious! 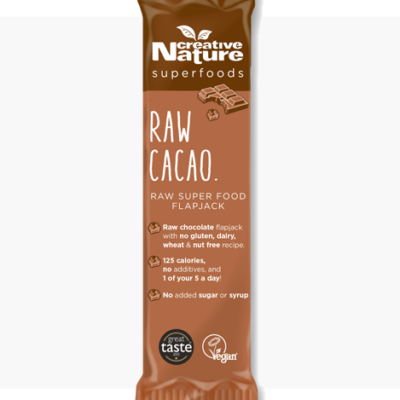 Much tastier and sweeter than most natural raw bars without any of the sweeteners. Super dense and filling to keep me going through the afternoon at work. Need more of these in my life! I snacked on these during marathon training and marathon too, definitely one of the most tasty raw bars in the market and gave me much needed energy and nutrition too! I bought a mixed box an they are all just super tasty and certainly up the energy levels without any compromise on taste! I’ll be back for more as my friends have snaffled loads too!